The other week while I was enjoying the exquisite caramelized pear and gorgonzola omelette with bacon and pecans I thought that apples also go well with gorgonzola. I just bet that an apple version would also be amazing! My thoughts drifted a bit then and I was thinking about how caramelizing the apples in the butter and brown sugar reminded me of apple pie. Then I had a strange thought; I had heard of apple pie being served with cheddar cheese. How about a caramelized apple and cheddar omelette? Once again, I could not resist throwing on some bacon and I had some candied walnuts on hand so they went on as well. The caramelized apple and cheddar omelette with bacon and candied walnuts turned out amazingly well! The sweet caramelized apples and the melted cheddar and the salty bacon flavour combos were so good and the crunchy candied walnuts added a nice contrasting texture. I really like the way the cheese and the caramel melted into the eggs infusing them with a mouth watering blend of sweet and savoury. I will definitely be making this omelette again and again. A perfect breakfast for a weekend morning! Add the sugar and cook until bubbly minutes. Add the apple and saute until tender, about 5 minutes. Lower the heat and and sprinkle on the cheese and bacon and let the cheese melt just a bit. Slide the omelette out onto a plate and garnish it the candied walnuts and enjoy. i'm so glad i found your blog…i will be picking it apart for the next few days…i've already browsed through a number of your breakfast recipes and i can't wait to try some out!! I love how you are fearless with omelet making—always such unique flavor combinations! gosh I just love your endless flavor combos. seriously. Now that is an omelette! The description is making my mouth water! I will be trying this out for sure. What a great flavor combination! I didn't believe in the apple/cheese thing until I tried it for myself in appetizer form… it's a winner! What a beautiful and delicious breakfast. I love the flavor combination – I always mix these flavors on salads, and sides, but never thought to put these things in an omelette – great idea! what size pan do you use for your omelets? thanks! 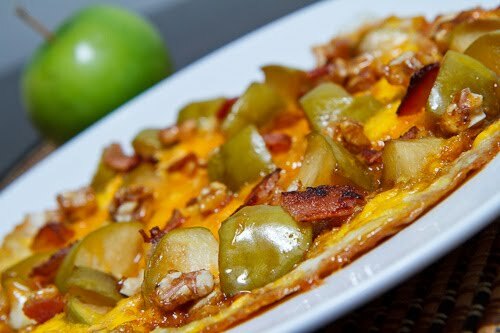 YUMMM I LOVE the combo of cheddar and apple in omelets, but I haven't tried the walnuts with it! I will definitely need to try this! My heart be still – I love the combination of sweet and savory in this! As usual, the sweet and savory mix never fails. The apples are unique for sure. I love apple with cheese, throw in some nuts and for me that would make a perfect meal…I have not even thought of an omelette idea…thank you for always broadening my vision about food combinations. I would never have thought to put caramelized apple in an omelette. It sounds good with the cheddar, bacon and walnut combo! Sounds great! I love the combination of fruit and strongly flavored cheese! I like apples so much more than pears and so I am definitely loving this recipe! Excellent combination of things. Where do you find all of these delicious recipes? Yum! That looks heavenly. Very tempting Omeletee..will try them soon and let u know…. Oh Mah Gah! That sounds so awesome! My sister finally convinced me on the apple cheese thing and I haven't looked back since! I can't wait to send her the link to this. Have a great day Kevin! sounds fantastic, you can't go wrong with pears and gorgonzola! Candied walnuts are a first for me in omelettes. You made unique recipes. Awesome combination of flavors and textures. Yum! Can't wait to try this. I am constantly amazed by the great recipes you share with us. Very creative and nice combo! That's an interesting omelette. Looks delicious! Great picture Kevin! I find it so hard to get a good picture of anything flat. Cassandra: The pan that I use for my omelettes is about 7 inches across on the bottom. Wow, that's a new combo of flavors for an omlette but really just sounds perfect! This is such a great flavour combination – can I come round for lunch?! Wow, this is a very interesting combination! I love testing how the tastes go together so I'd love to try this recipe. Looks really good. I just made this as a post-Thanksgiving breakfast! I used shredded turkey instead of bacon and pecans instead of walnuts. It was so good!